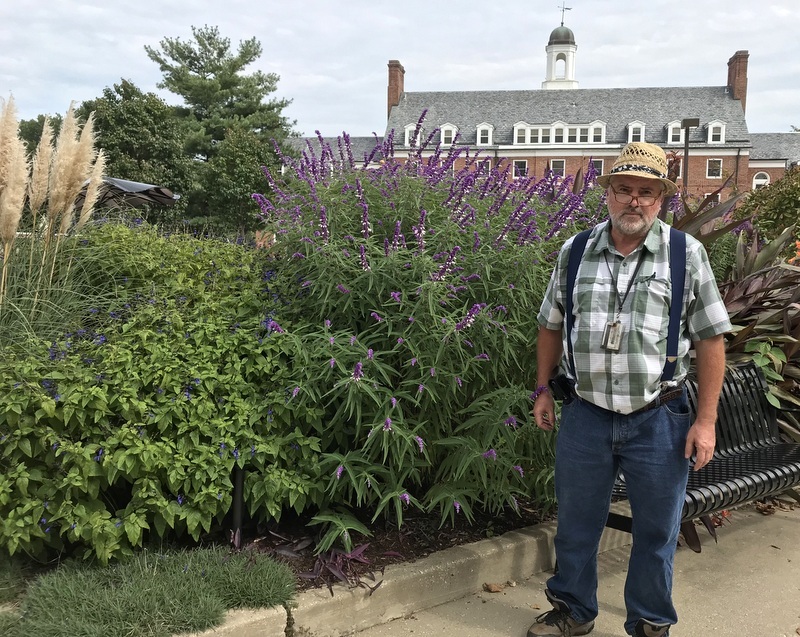 Horticulturist Sam Bahr, like so many people who work at the University of Maryland, is someone I first met as a neighbor in nearby Historic Greenbelt. 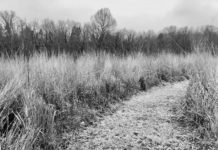 He got his coveted job at the UMD Arboretum and Botanic Garden back in 2008 thanks in part to his good education – a B.S. in agriculture from Kansas State University, majoring in ornamental horticulture with an emphasis on landscape design and operations. 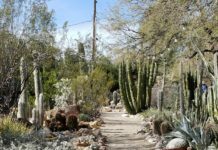 I asked Sam to show me some of his work there and he generously gave me a guided tour, with follow-up details about my favorite plants blooming there in early October. 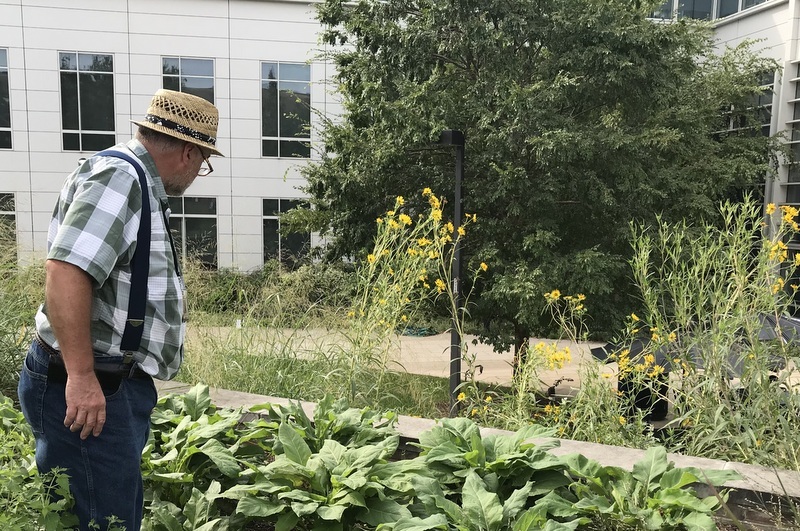 It was especially fun for me to hear about the plant-lovers around the U.S. and locally who’ve donated plants to Sam for use at the university. More proof to me that serious plant geeks like Sam are a generous bunch with their cherished seeds and cuttings, even with people they’ve only met online. 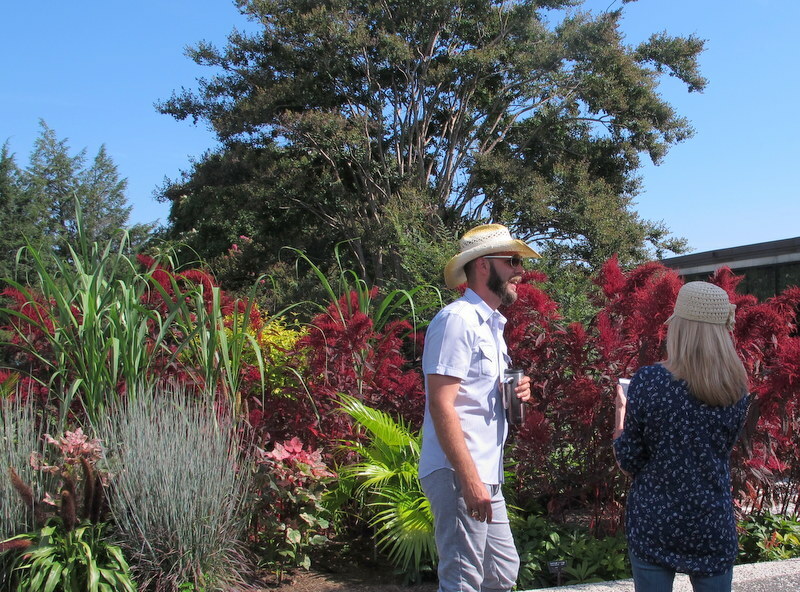 My mini-tour started in Tawes Plaza, where he designs, chooses plants and supervises maintenance of the extensive gardens in that central spot. Above he poses with a dwarf Pampas Grass (on the left) and two fabulous Salvias. Here’s a closer look at them. On the left is ‘Black and Blue’ Anise Sage (Salvia guaranitica), which is a hardy perennial that spreads over time via underground rhizomes. 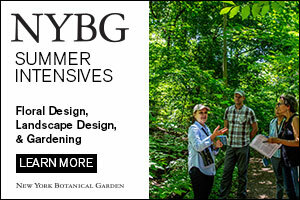 Hummingbirds love its flowers, which start blooming in mid-summer. On the right is ‘Greenwood’ Mexican Bush Sage (Salvia leucantha), which is a tender perennial that needs a very warm, sunny, winter micro-climate in this area to survive the winter (and then only with the help of heavy mulching). The staff cuts it back to 24 inches during the week of Thanksgiving and places a 12-inch mound of protective mulch over and around them. Here it blooms from mid-September well through frost, and the bees love it!. 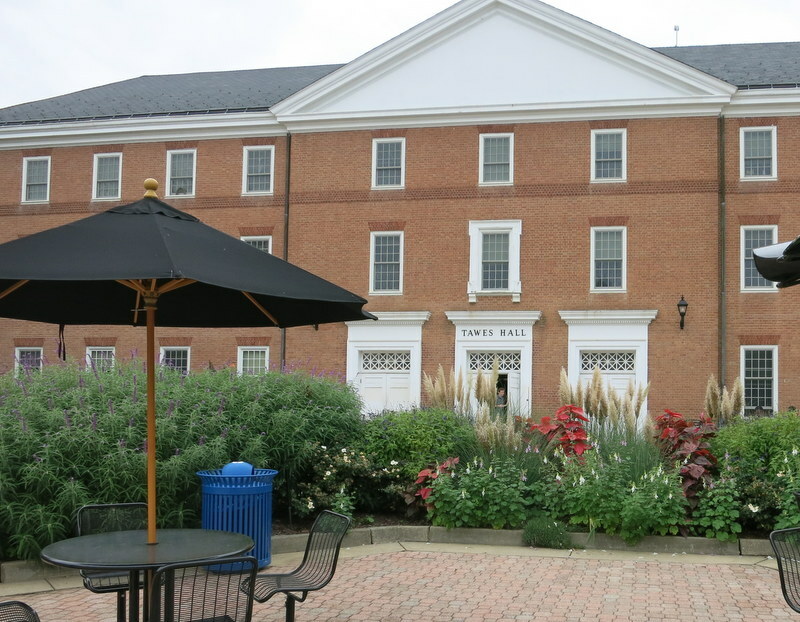 Tawes Plaza is such a prominent place, it has to look good all the time. In this view the plants with white flower spikes along the edge of the bed are South African Foxglove (Ceratothica triloba), an annual that reseeds itself quite well. 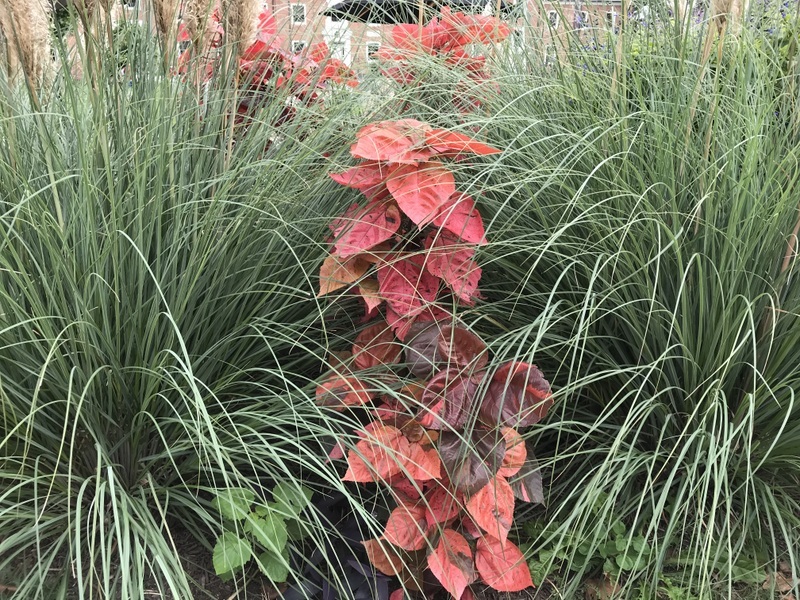 In the center between two ‘Blue Bayou’ Dwarf Pampas Grass (Cortaderia selloana) is the tropical Copper Leaf Acalypha. On the left is Blue Ginger (Dichorisandra thyrsiflora), a tropical plant that needs to moved indoors or to a greenhouse when temperatures drop below 50 degrees. It can start blooming in mid-summer, but it’s at its best in early fall while it’s still warm. Like now. On the right is ‘Crimson Star’ Egyptian Star Flower (Pentas lanceolata), which is visited by many hummingbirds and butterflies, including Monarchs. Sam has found this red form of the Egyptian Star Flower to be far more attractive to hummingbirds and butterflies than the pink, white and lavender forms. More tropicals at their lushest! On the left is a Canna that’s hardy to Zone 6 with very small flowers that are beloved by hummingbirds. This canna was a gift from plant-lover Andy Schenk in Pennsylvania, whom Sam met on Facebook through mutual plant people. Andy works for a wholesale nursery and has a large collection of plants in his home, which he propagates and shares with friends. Sam knows of at least one of Andy’s home-bred plants that’s made it into commercial distribution – the ‘Urban Spire’ Dawn Redwood. 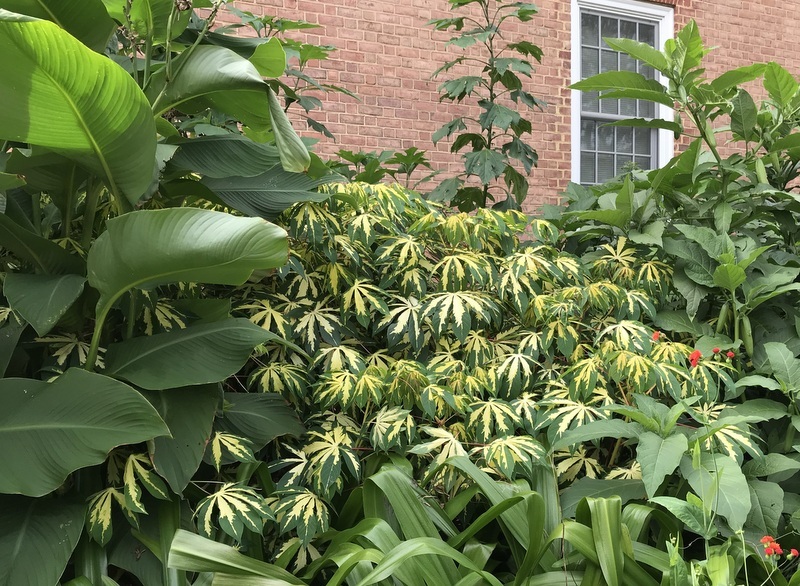 Next to the canna is a Variegated Tapioca (Manihot esculenta) that’s not hardy here, so it spends the winter in the UMD greenhouse. 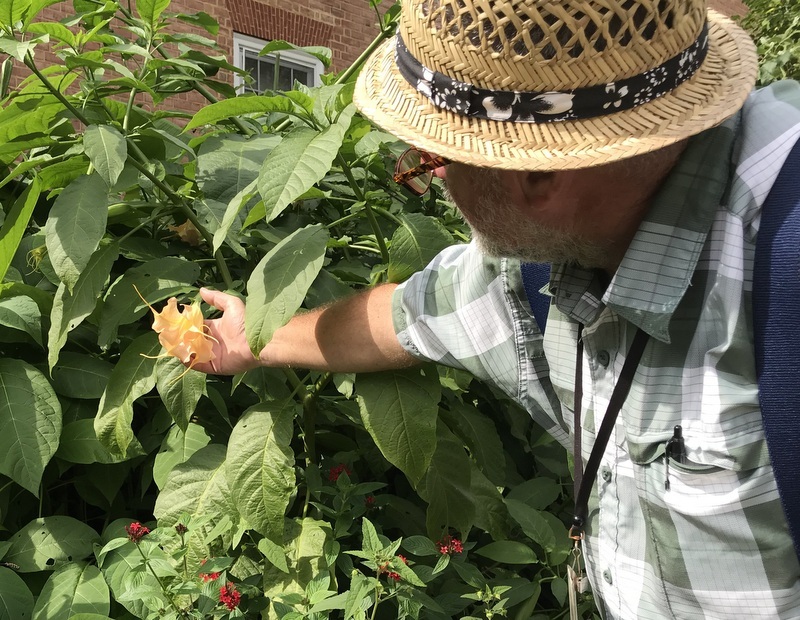 Here Sam is pointing out the bloom of a Brugmanis cubensis ‘Georgia Peach,’ another plant that’s overwintered in the greenhouse. 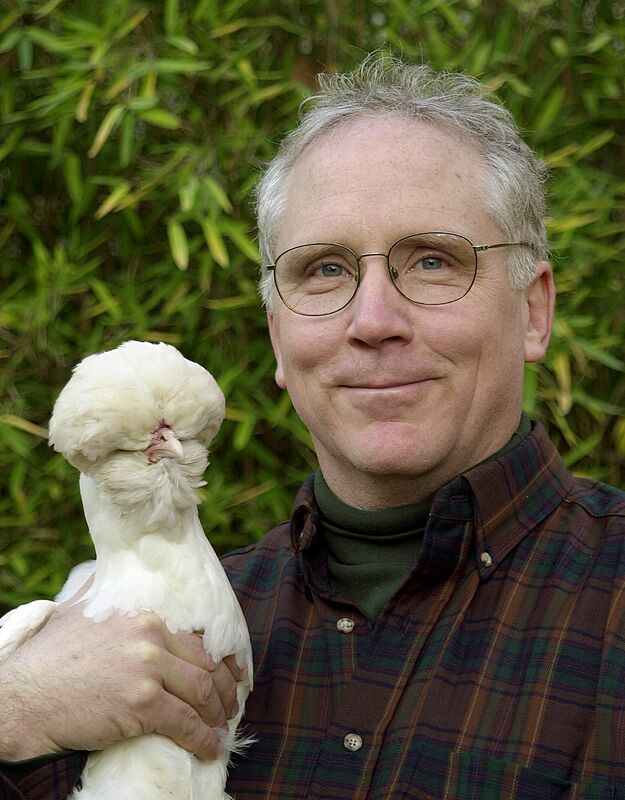 It was the gift of another collector – Padric Stephenson in Auburn, Alabama. 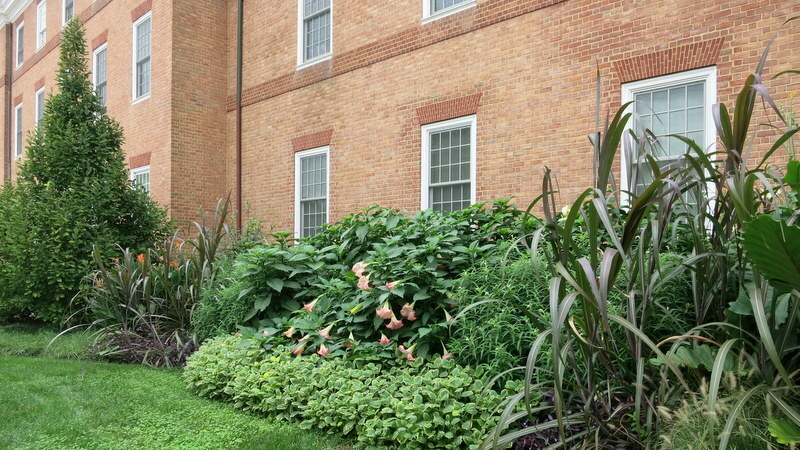 When Padric needed to downsize his very large collection of brugmansias, he gave cuttings of many of them to Sam, so a number of his plants were blooming in Tawes Plaza that afternoon. Padric is another Facebook group connection, by the way. Above are two plants donated to this garden by a local horticulture colleague of Sam’s – Bradley Evans at the National Arboretum. 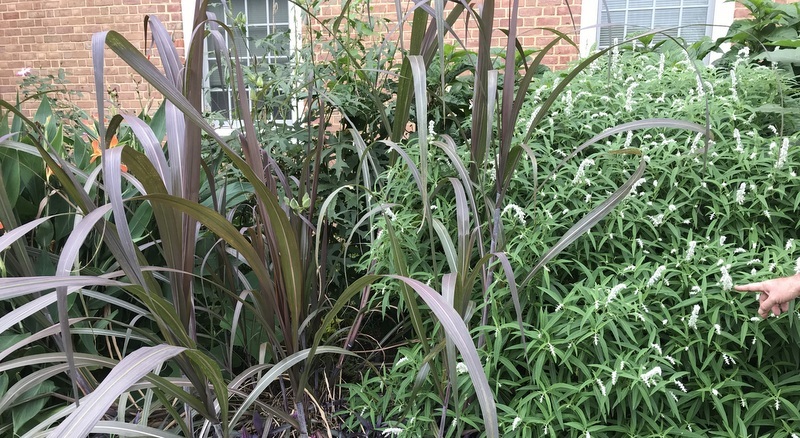 From the left they are ‘Pele’s Smoke’ Sugar Cane and the ‘White Mischief’ Mexican Bush Sage (Salvia leucantha). Here’s Bradley giving garden writers a tour of his courtyard garden outside the Arboretum’s Administration Building. 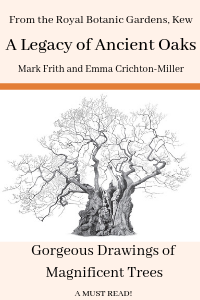 He repeatedly credited Sam as the donor of some of these stunning plants, so clearly plant-sharing is a lively two-way street. Just outside of Tawes Plaza Sam showed me this very lush ‘Dropmore Scarlet’ Honeysuckle (Lonicera x brownii) which has an amazingly long long bloom – from late May through mid-November or sometimes later. 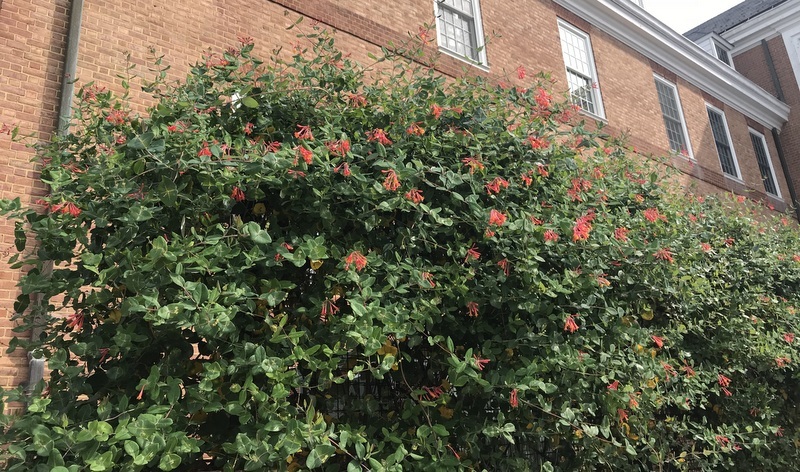 It’s a hybrid of the native Lonicera sempervirens and a nonnative, with the result recovering from damage caused by aphids much better than Lonicera sempervirens and blooming better, too. 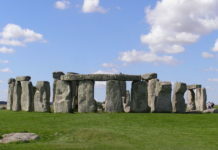 The staff cuts it back all the way to the trellis every two years to rejuvenate it. In front of the Brugmansia is a foliage plant that Sam says has never bloomed in this spot – Plectranthus fosterii ‘Green on Green.’ Its fuzzy leaves have a nice fragrance. 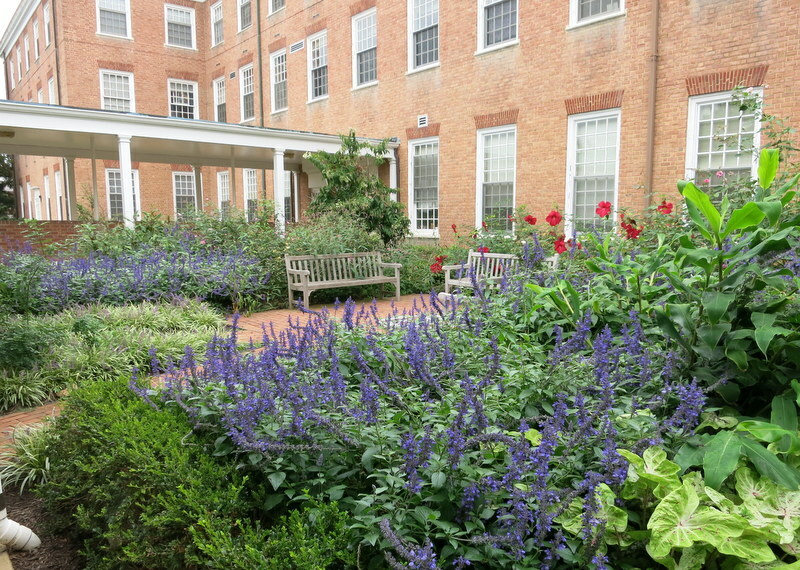 Here’s a nearby courtyard, where the stand-out plant right now is ‘Rockin’ Playin’ The Blues Salvia. It was swarming with pollinators, especially bees. 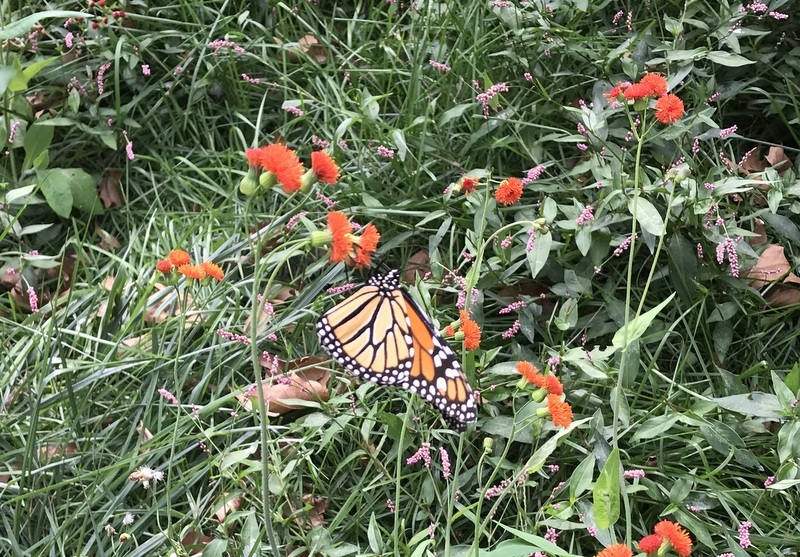 Finally, Sam showed me what’s been identified as the best native pollinator for Maryland gardens by UMD entomologist Dr. Paula Shrewsbury. It’s the Cup Plant, which had finished blooming when I visited. Behind it are some still-blooming sunflowers. There were dozens more great plants that had bloomed earlier in the season, and the campus is strewn with even more gardens that Sam has designed and then packed with similarly unique plants – including a meadow I’m dying to see on another visit. What is the botanical name of Cup Plant? 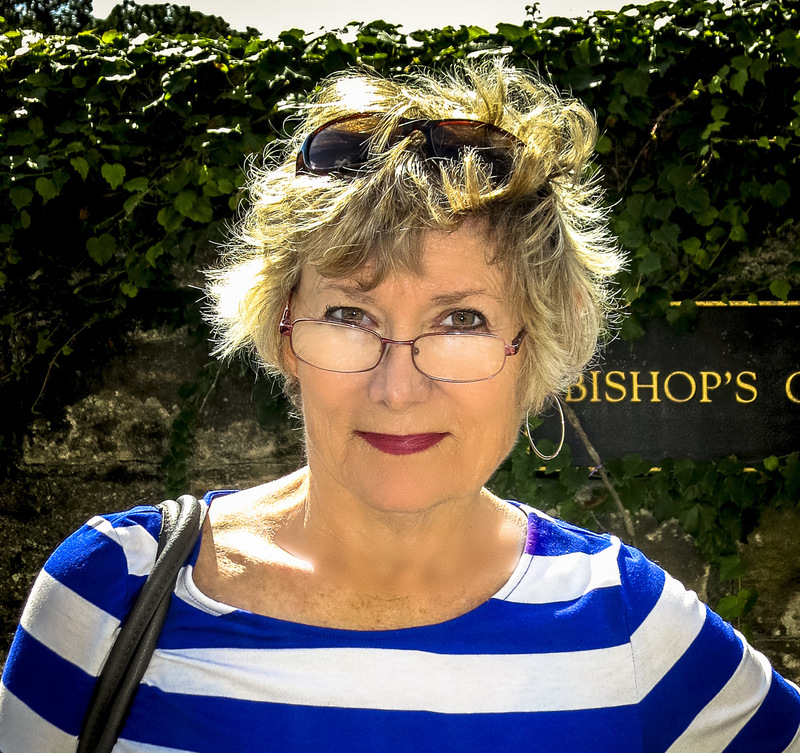 Thanks Susan. It’s lovely, but alas, I live in South Florida.